When I still hoped to make it as a comic artist, I was very inspired by what used to be called underground artists. One of the artists whose work impressed and inspired me was Basil Wolverton. Their work was hard to find in the seventies and most of what I have seen back then was in the form of Xth generation Xeroxes. “A resident of Vancouver for 59 years until his death in 1978, Wolverton became an overnight sensation in 1947 with his interpretation of Lena the Hyena. His conception of the toothy, wart-nosed cartoon character won a nationwide contest sponsored by Life magazine and took the country by storm. Born July 9, 1909, in Central Point, Ore., Wolverton moved to Vancouver as a boy. After attending school here, he tried many careers before settling on cartooning. From the spare articles that I have read about the man, I knew that he was also a musician. He played ukelele, but I had never heard any of his recordings. I didn’t even knew they existed. 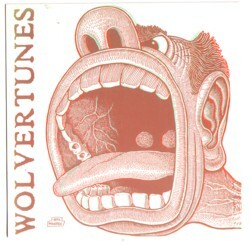 But a few days ago Ed Veenstra gave a 7inch, released by Sympathy for the record industry and 3D-Zone in 1992, called Wolvertunes. 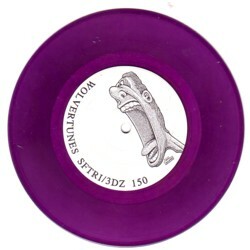 The sleeve is in 3D, of course, and the vinyl is purple, which already made my day before I heard the record itself. I have spend some nice hours surfing the net for info about Basil Wolverton and his work. I will not use the blog to overload you with links, but after yesterdays surf tour i like his work even more than I did already. On the Wolvertunes record he sings two songs. Here is the side I like best, Chasing rainbows.